An exhibition currently on at the Art Gallery of detailing the career of Osamu Tezuka – the manga artist best known to the world as the creator of Astro Boy and Kimba the White Lion. He also made Metropolis that was later to be made into an anime feature film by Katsuhiro Otomo. It was based super-loosely on the Fritz Lang film of the same name and tells the story of gender switching robot, Mitchi, in search of its parents. The anime made in 2001 and directed by Katsuhiro Otomo brings the story back to something closer to the themes of Lang’s original silent film. That is not why we are here. We are here because of one of the pages of the manga on show in the exhibition depicts Mitchi flying through the city knocking buildings over. The page sticks out for two reasons. Firstly it is hard to look at images of generic office towers being snapped in two, with screaming people jumping out the windows innocently anymore. For obvious reasons. And secondly, it bears an uncanny resemblance to pages out of Katsuhiro Otomo’s epic manga masterpiece, Akira. At around 2000 pages over six volumes, Akira is the kind of book that takes a good solid amount of time to work through and so it was coincidental that in the week following the attack on the world trade centre I found myself reading Volume 03 on the bus. Volume 03 where towards the end, Akira in reaction to the execution of his unleashes his psychic powers, levelling New Tokyo. For about 20 pages, New Tokyo is given a brutal, beautiful, beatdown. It was the reason I love the work of Otomo – over the top, epic stories told in obsessive detail. But on the bus that week it was, of course, not acceptable reading material. 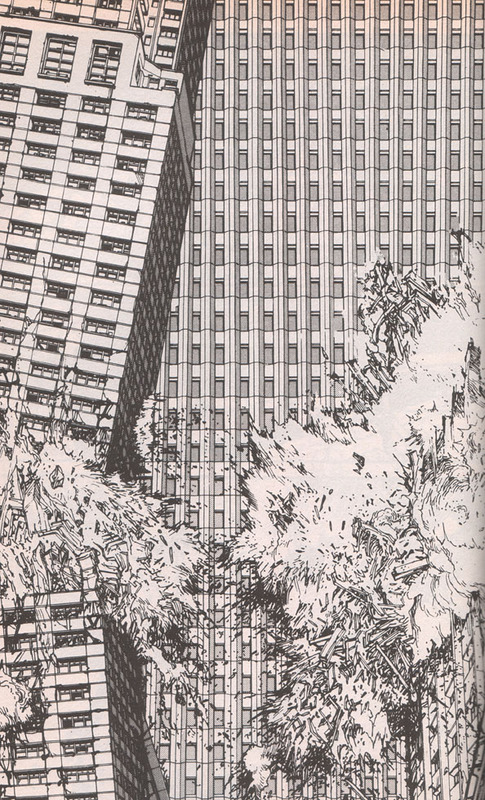 Then, in Volume 04, it is a somewhat disgruntled Tetsuo who this time creates a hole in the sky that brings portions of the buildings previously destroyed by Akira crashing back down on New Tokyo.